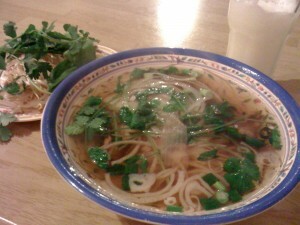 Yes, there really is pho in Klamath Falls. And, yes, it really is good. There are certain dining experiences that are so mind-blowing, I have to let them marinate awhile. Pho Hung was such an experience. So, off to pho I went. This process involved driving up and down Sixth Avenue for about a half hour until I found this hole in the wall restaurant was closer to my hotel than I expected. I had seen some photos on Flickr of Pho Hung, so I at least knew what the place looked like and some ideas on what adventures it might hold. But, I still wasn’t quite prepared. First off, the “false front” referred to on many reviews of Pho Hung on Yelp logistically refers to the fact that the door marked as the restaurant is sealed shut and the door to what appears to be an ultra-bright, sensory-overload grocery store is also the entrance to the restaurant. 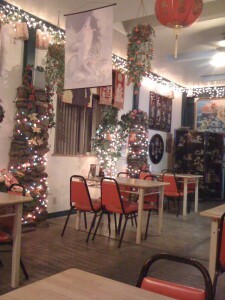 As I was beckoned down the rabbit hole, I passed through the hallway wall-papered with photos of take-out items from floor to ceiling, then emerged into a bright, tropical themed dining room in the back. There are strands of Christmas lights everywhere plus fabric banners depicting various anime characters hanging on the walls. Plants (I was unclear if they were fake or real or a mix) vine up and down and around beams across the room. Yet, for as chaotic as the interior design is, the dining room exudes a clean, warm feeling, which is underscored by the exceptional service. Everyone working there checked in: about if temperature was alright for me, did I have a seat that felt adequately engaged with the rest of the restaurant and what kind of mood I was in and how could that be translated into the most perfect meal for me in the moment. Needless to say, I was charmed. It was a lesson in life: don’t hold back with the sauces you can’t name and the various herbs that seem like they would mix poorly. Just go for it, by the fistfuls preferably. The aggresive alchemy worked. I enjoyed that bowl of pho more than any bowl of pho I’ve had. I learned timidity and pho don’t go well together. If you don’t have the balls to try all the flavors available and create the meal you want, then you will be disappointed. 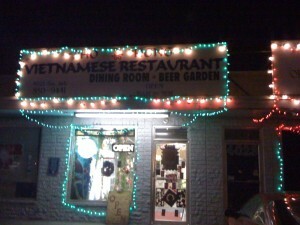 Thus, the pho of Klamath Falls kicked off the theme of my 2010: create your own reality. Thanks, Pho Hung.